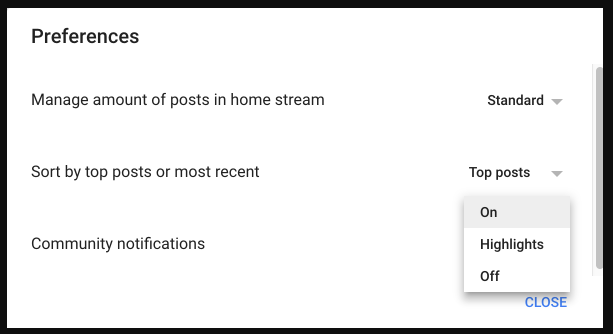 Until recently, only two notification levels were possible for Google+ communities and collections you're subscribed to: on or off. Thankfully, someone at Google has realized how frustrating it is to only get all notifications or none at all, and a new Highlights option has just been introduced. Selecting Highlights will give you periodic digest notifications with some of the top posts from all of your communities and collections. This should mean that you won't miss out on any important news or updates while at the same time not getting all the usual spam. You should see the feature added to your account over the next few days if it's not already there. You can find the setting by navigating to the three-dot overflow menu on a community or collection page and then hitting Preferences. The last option used to be a toggle that read "Get notified about new posts" but now it should look like the above image, with the Highlights option added.